At first blush, We Are the Dwarves is reminiscent of The Lost Vikings. It features a trio of Dwarves (who also happen to be astronauts, more on that later), each with a unique skillset, who must work together to survive a hostile environment and overcome various sorts of challenges. But as this new trailer makes clear, it's a faster-paced experience than that great old classic, and most of the challenges in question arise from hordes of nasty, murderous space bugs. We Are the Dwarves is a "tactical exploration and combat adventure" featuring three unique characters, each of them customizable through its own individual skill tree. Gameplay can be paused to set up command sequences, and enemies will react to your presence in different ways, based on movement, noise, or even your digital scent. You can opt to control a single character or manage all three, and take a stealthy approach to problem-solving or go in loud and hard. 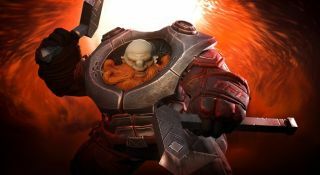 It looks like a fairly conventional action-RPG in the trailer, but both the Kickstarter, which failed, and the Greenlight, which succeeded, say that it will be a "story-driven" game in which the characters—astronauts from the three Dwarven clans, on a quest for the powerful Stars that exist within the Universe of the Eternal Stone—suffer a calamity with their drill-like ship and end up lost in an unknown corner of the cosmos. It's an intriguing setup, in part because it's so entirely unnecessary: The developers could have built precisely the same game around the old "Dwarves dug too deep" trope, and yet they chose to tell this more exotic tale. It may not matter in practical terms, but there's an inherent silliness to it that I like. We Are the Dwarves is set to come out in February 2016. Until then, you can find out more about what's in store at wearethedwarves.com.